The Mannheim military community is located in southwestern Germany, approximately 100 Kilometers (Km)/60 miles south of Frankfurt and 25 Km/15 miles northwest of Heidelberg. Mannheim is located in the German state of Baden-Wurtenburg. This is only short distances away from great attractions such as Euro Disney and the Black Forest and other countries like France and Austria. The weather in the area is mostly like that of the northeastern states like Ohio, Kentucky and Indiana. winters are cold with moderate snow and summers are hot but not as humid. The Army military units in the Mannheim community fall under the major command of United States Army Europe (USAREUR). The mission of local US Army units is predominately Signal, Transportation, and Military Police support. 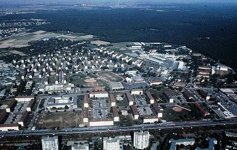 Also the US military confinement facility for Europe is located on Coleman Barracks. The approximate total population assigned is 15,000 which consists of: Army active duty, 4,000; Air Force active duty, 200; Army family members, 6,484; Air Force family members, 197; civilian employees and family members, 3,266 and US military retirees, 727. The Mannheim Military Community had its original roots with the American occupational forces immediately following World War II. Since 1974, the mission has been to be the single point of control for Americans and to provide base operations support for tenant units in the assigned geographical area. The Mannheim US Military Community Activity (USMCA) was consolidated with USMCA-Worms in 1990 and was reflagged as the 293rd Base Support Battalion (BSB) of the 26th Area Support Group (ASG) in 1991. The current area of responsibility extends over 938 square miles with a total of 20 installations. The 293rd BSB supports units from every major command in USAREUR and some units not headquartered within the Federal Republic of Germany, totalling over 15,000 residents. The six major troop billets of Sullivan Bks, Taylor Bks, Turley Bks, Spinnelli Bks, Coleman Bks and Funari Bks are located in the suburbs of Mannheim. Friedrichfeld depot is located outside the town of Schwetzingen in the direction of Heidelberg. The two major housing areas are Benjamin Franklin Village (BFV) located adjacent to Sullivan and Funari Bks in Mannheim and Thomas Jefferson Village (TJV) in Worms, approximately 20 miles north of Mannheim. The Mannheim military community is comprised of several posts within a relatively small area in and around Mannheim. 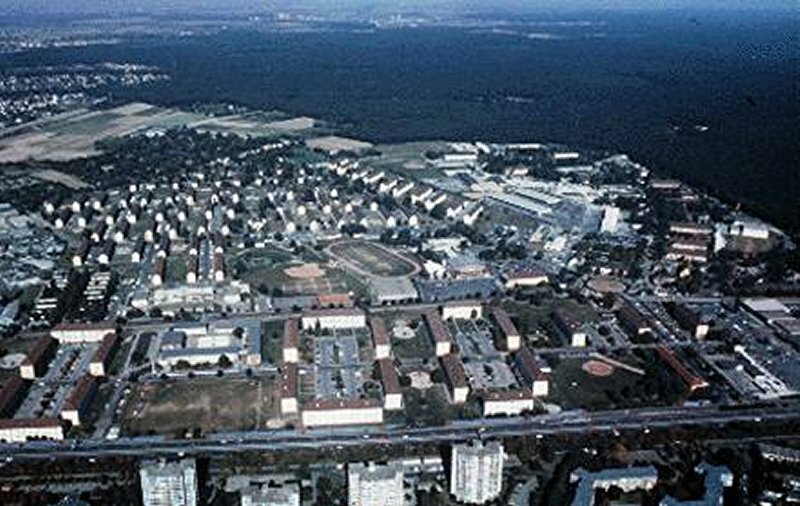 Sullivan, Taylor, and Funari Barracks, Benjamin Franklin Village housing and the military shopping area are all located within walking distance of one another in the Mannheim suburb of Kaefertal. Spinelli Barracks is approximately 10 minutes by car circling southeast around Mannheim. Coleman Barracks is located off Autobahn A6 at the town of Sandhofen, approximately 20-30 minutes by car. Turley Barracks is approximately five miles toward the center of Mannheim. Thomas Jefferson Village housing is located in the city of Worms, 30-45 minutes away. Thompkins Barracks and Friedsrichfeld depot are located just off Autobahn A565 toward to Heidelberg. Mannheim is known as the city of quadrangles (blocks). On 17 March 1606, Prince-Elector Friedrich IV of Palatinate layed the plan for the fortified city of Mannheim with streets at right angles. The German word 'Mannheim' translates to "A place where men are at home". The city of blocks, second largest city in the state of Baden-Wurttemberg, is located at the center of the Rhine-Neckar river triangle. Mannheim and its suburbs include more than 300,000 people. The population of the greater Mannheim-Ludwigshafen urban area exceeds half a million.